If the bright lights of Sin City are calling your name, Vegas Vegas mobile slots by mFortune is the perfect way to bring a slice of the Nevada desert into your living room. No expensive plane tickets and long haul flights needed! With a giant progressive Jackpot worthy of a bricks-and-mortar casino in Vegas, and a mini-game where you can accumulate mega multipliers, Vegas Vegas captures the energy, bright lights and glamour of the real thing. Get into the party mood with this stylish mobile slots game. The name says it all! Leave your passport behind and jump right into a Las Vegas adventure with this modern twist on a traditional slots machine. It’s bright, bold and bursting at the seams with Sin City flavour. Bright lights, big bonuses – what else could you possibly want from a mobile slots game? Navigating the controls of our Vegas Vegas is, thankfully, altogether easier than filling out a visa application to visit the real deal. All you need to do is tap the ‘+’ and ‘-‘ buttons to increase or decrease your bet amount and the number of win lines you’re playing across. Once you’re happy with the bet and win line combination, which affect your total bet amount, tap ‘Spin’ to start. Your total bet amount is your original bet-per-line, multiplied by the number of win lines you’re playing across. So, for example, if you bet the minimum amount of 10p across 9 win lines you’d have a total bet of 90p. Alternatively you could bet £1 over 5 lines for a total bet of £5, you’ll feel like you rule Caesars Palace when you mix these combinations up any way you like! Minimum bets start from 10p a line and increase all the way through to £20 a line. After configuring your total bet amount to a level you’re happy with, simply tap ‘Spin’ to watch the reels roll in and stop at random. Much like the classic one-arm bandits that inspired this very game, win lines in Vegas Vegas mobile slots pay left to right. What you’ll need to line up to light up a win depends on the symbols you’re trying to Las-so. Some wins pay out with 2 or more symbols on an active win line, while others require 3+ to get the neon flashing. Wins will be highlighted on-reels before the associated winnings are added to your account balance. Wins will be awarded in the form of multipliers of your original bet per line. Just how glitzy that multiplier is depends on the symbols you spin in on an active win line. You can find all symbol information and win values in Vegas Vegas’ paytable. We want to be a friendly face in the flash of neon lighting along the Vegas strip. That’s why we’ll total up winnings across multiple lines to give you a higher total win. We’ll warn you though, we can only award the highest win from each individual line. Luckily, what happens in Vegas Vegas mobile slots doesn’t stay in Vegas Vegas, which could be an especially grand cause of celebration if you line up Wild symbols on an active win line. That’s because Wild symbols substitute out for any other symbols, except for mini-game and free spin Scatter symbols. That means, if you line up two 10 symbols next to a Wild, you’ll receive a win that’s equivalent to having three 10 symbols! We don’t mean to take the shine off of proceedings, but you can’t win the Vegas Vegas progressive Jackpot with a Wild symbol on the winning line. 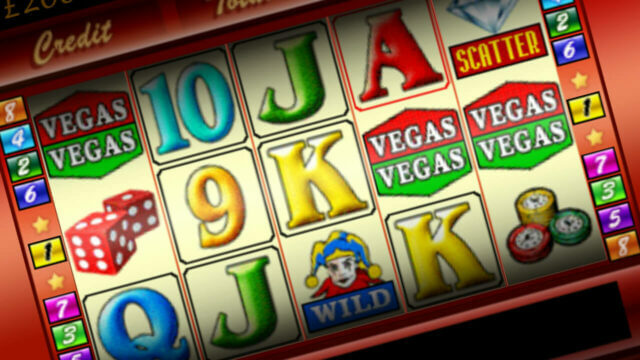 Vegas Vegas comes loaded with a mini-game that gives you the chance to maximise your multipliers in true Vegas style. You can reach the Wheel of Fortune mini-gamewith two or more gold bar symbols on a valid win line. Spin the Wheel of Fortune and accumulate the multiplier you land on. The more symbols on a win line, the bigger the multipliers available to play for. Will Lady Luck be on your side in this Vegas gameshow spectacular? Vegas Vegas mobile slots has a theoretical return to player of 91.24%. This is based on long term playback. System malfunctions void all payments. Monies are staked in the following order: winnings, player deposits, bonus credit. mFortune general terms and conditions apply.